Sir Joseph Hood Memorial Wood is a 1.7 hectare Local Nature Reserve and a Site of Borough Importance for Nature Conservation, Grade I, in Motspur Park in the London Borough of Merton. It adjoins Sir Joseph Hood Memorial Playing Fields, and both are owned and managed by Merton Council. 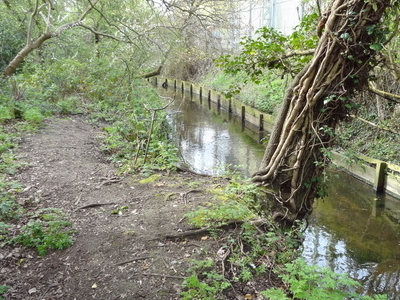 The Wood is bordered by the Beverley Brook, which forms the boundary with the London Borough of Kingston. The site has a wide range of birds, such as nuthatches and treecreepers, and trees, including mature oaks which date to the nineteenth century planting. The diverse shrub layer has species such as Midland hawthorn and ransoms which probably date to an ancient hedgerow predating the wood. Access is from the playing fields off Marina Avenue. Here's the our members favorite photos of "Nature Reserves in London". Upload your photo of Sir Joseph Hood Memorial Wood!